It completely nullifies opponent's removal. Seems alright to me. Hymn is an option for pure BG lists. For 3 colour lists you're probably best off running Thoughtseize. For recursion I like Meren a lot, since she's GSZ'able. In a fair list I also run a Volrath's Stronghold, in lists with Rectors (either fair or Evo Leap) I run neither. What do You mean by fair list? ;-) I'm mostly in rhino fit, now with Meren and Witness on board. But sometimes I feel it's not enough. I've played her in lists with Titania and Trackers. The issue with Safekeeper + Ramunap + ??? is like...it's a bit over the top. Safekeeper to protect something that will win (???) ((unless you are going to use Ramunap land recursion to win...which is slow and doesn't deal with threats already on the board)) plus something to help recur the lands is just way too slow. If you have Safekeeper in play -already- by the time you cast Titania, then fine. If Titania by herself survives a turn...then you probably don't need the followup Safekeeper anyway. Safekeeper early on doesn't ramp you, you'll probably spend two mana early on to GSZ for Vet instead. Wasting a GSZ to get Safekeeper in play -before- any other threat is generally a waste of a turn or waste of a GSZ. If there's an increase in targeted destruction effects (Trophy) then a single Meren might be better. E Witness can get anything back from Trophy anyway. Safekeeper + Ramunap is fine on the land destruction front, but it's a poor plan to counter the T1 delver that is going to kill you. Posting while on deployment. Bear with me. The new 1GW guy seems nice and flexible, I woukd run 1-2 of. Replaces Sage, and likely Qasali. Meren looks a but stronger, as does Rec Nightmare with no DRS in the format. I think Assassin's Trophy is VERY interesting considering we exploit PTE to great effect. 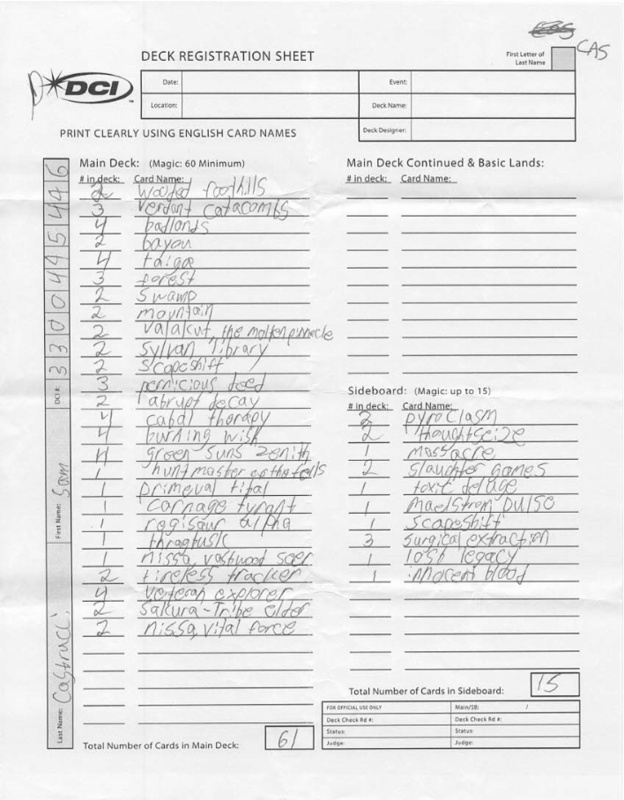 However, Daze and Snare are really where you lose those Delver matchups. I would consider still keeping your removal and just tweaking numbers. Ex. 2 Trophy 3 Decay 2 Path still is a nice split. I was originally thinking Trophy is just another good removal spell. The more I've played with it though, the more I'm on the 4 of plan. It's just that good. @sdematt You've found the new good stuff. I've replaced AD for AT 1-on-1 for now, I run a 3 PtE, 2 AT split. Assasin's thropy placed in Abrupt's slots? Maybe You play split or other versions? For better or worse, most folks moved over to the discord. Last edited by Mr. Safety; 11-09-2018 at 09:00 AM. Went undefeated, there is no top 8 in leagues, so position 6 is just an arbitrary ranking. Oops, thanks for the correction. Edited. About the list: dunno, seems many targets for me. Ground Seal maindeck is... strange, now that DRS is gone? Plenty of Surgicals going round. 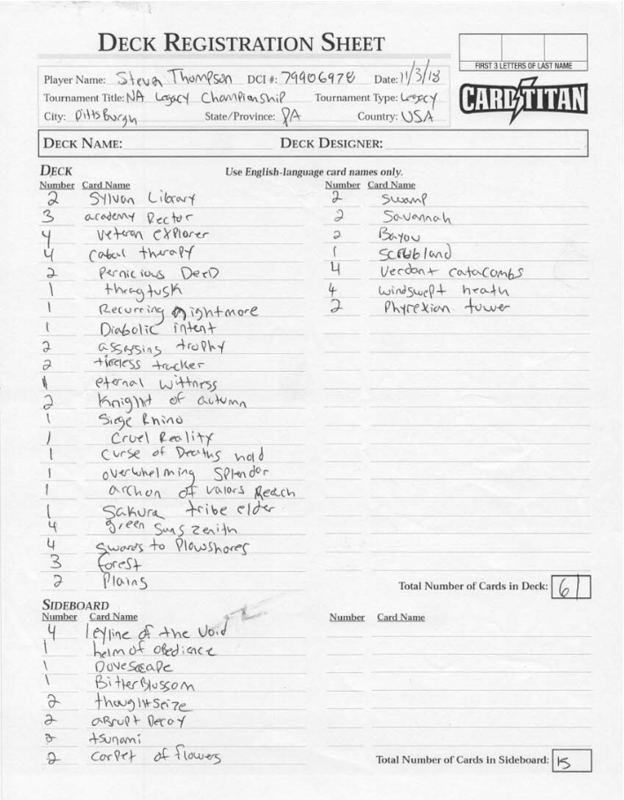 The only duds in the list in my opinion are the Sandwurm Convergence and Curse of Misfortunes. Splendor makes Convergence obsolete, Misfortunes is unnecessarily slow and risky. Cruel Reality is a hard lock once your opponent is in topdeck mode... Convergence is just a worse Splendor. As a clock it's irrelevant. Once you establish the lock you can kill your opponent with whatever. I am not on discord, just busy. I do not even know what discord is.